Making an appearance at Intersolar 2017 Europe in June, Delta presented a broad portfolio of high efficiency PV inverters and battery energy storage solutions. The energy storage system ES30 series, is an all-in-one and highly scalable solution integrating li-ion batteries for up to 90kWh capacity with more than two hours of continuous 30kW back-up power. Also on show was the new high performance string PV inverter M88H series, featuring maximum 88kVA output power, peak efficiency up to 98.8%, active cooling and an electromagnetic interference (EMI)-proof design. By leveraging its core competence in power electronics, leadership in energy conversion efficiency and expertise in system integration, Delta develops intelligent solutions capable of optimising the adoption of solar PV power and energy storage not only to support the transition megatrend from centralised energy supply to decentralised renewable energy plants, but also to enable greater electricity costs savings as well as a more reliable and eco-friendly energy supply. Visitors to Delta’s stand had close access to key innovative and eco-friendly solutions, such as the Commercial Battery Energy Storage System ES30 Series, which is a 3-phase 90kWh li-ion battery energy storage system suitable for commercial and industrial applications. 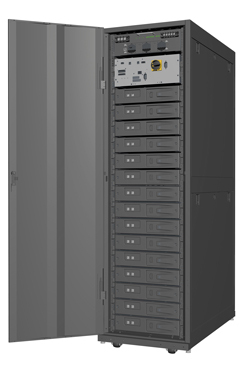 The AC coupled system in a standard 19” rack that features a flexible and modular design scalable from 6-90kWh battery capacity. A 30kW Power Conversion System (PCS) with a 0.99AC output power factor and integrated Battery Management System (BMS) were included in the scope of delivery. 30kW continuous power for more than two hours (with 90kWh battery capacity). When combined with the Delta PPM P3E Power Meter and the R4 Smart Monitor Energy Management System, many different customised energy usage modes can be realised. Maximised self-consumption of the self-produced energy for commercial buildings or small businesses. Peak-shaving and -shifting to allow the lower cost electric power to be stored to the battery bank as energy reserve, and the energy is then dispatched during peak rate periods for lower electric power cost. Can be utilised to control reactive power to stabilise grid voltage. High-power and high-efficiency string inverters are suitable for large commercial and ground-mounted PV plants with megawatt-sized solar arrays where optimum yield is important to ensure a valuable investment return from the system. Thus, Delta´s new flagship inverter model, the 3-phase M88H series, offers maximum 88kVA output power, active cooling and industry-leading peak efficiency of up to 98.8%. The Hybrid E5 energy storage system is composed of the E5 hybrid inverter as well as an external cabinet equipped with a 6kWh Li-ion battery, a Power Meter and a Smart Monitor. The Hybrid E5 storage system is designed for new PV systems and boasts a high charging efficiency up to 95% of DC electricity from the PV array to the battery without additional equipment needed. The Smart Monitor not only controls the E5 inverter and battery functionality in an optimised way but it also serves as a gateway for visualisation via mobile devices. Built-in customised energy management modes for various customer needs.